OK, as I have written previous it is more complicated than this but also more simple. But there are some compromises. Firstly, you can run a 6.5 Swede through a short action Tactical Rifle. I use one in a Rem 700 and AI stock with no problems. But, as we all know, no two Rem 700s are the same, so I had to have some work done on one bolt to open it up for the slightly bigger (Lapua) case. And to feed through the AICS magazines you need projectiles with a longer bearing surface. Lapua 123 grains are brilliant performers and Lapua 139s can also be loaded deep into the case. Velocity from an 18 inch (thank you named US brand for your banana bore) and 123 grain Lapuas is more than adequate for tactical style shooting out to 600m. Also about to try the 100 grain Bergers…. I have a chambered 6.5×55(GW)Swede.Its a left hand Savage–Short action receiver with a Douglas 28″ Barrel W/a 8.5 in one twist.Lapua case. The Bullet is a Berger 140gr. hybrid target. Powder IMR 4350/46 grs.Fed/210-m primer. COAL-3.165 ” The chamber reamer is a design of Greg Wally’s from Kelbley in Ohio. Its a great 1,000yard shooter. Shoots just fine! I like 6.5×55 because I can get once-fired norma brass from hunters for pretty cheap. Not having to seat the bullet deep into the casing and getting a bit more performance for the same pressure is just an added bonus. The hornady 6.5 CM brass is also of very high quality. Great, detailed cartridge comparison! You should do these more often. The 6.5×47 Lapua is more than a midrange cartridge. It won the Williamsport 1000 yard Super Shoot last year. I don’t recall the 260 ever winning even a match @ 1000 yards. My update on the first comment written in April 2016. Now using Berger 130s that go at the same velocity as the 130s in a 6.5 Lapua but uses 5 grains more powder. Ed: thank you for noting the over saturation of another 6.5 case. Hopefully someone has the time and enthusiasm to do a modern study of the 6.5 Jap. 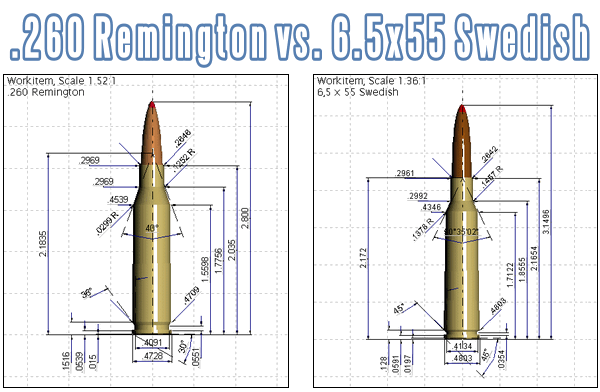 The creedmore IMO is a complete fad, if Remington had pushed the 260 at the right time we would all be talking about it. I use a 260 Tikka CTR in a long action LSS chassis to seat the 146gr ELD out as far as possible, I’m getting close to 3k fps in a 20 inch barrel. I’m not sure where your velocity data comes from but with hand loads you are 2-300 fps off. Creedmore doesnt have the case capacity to keep up and the 6.5 creed is almost identical. The .260 isn’t a long range round? There’s a big difference in folks kicking around opinions and folks who actually win matches. I believe the folks who win the matches. Of course the folks mentioned below can beat you with their rifles. Or with your rifles. But the records seem to indicate the round is up to the job. Brandon Green won the NRA Long Range Championship with it in 2013. Sherri Gallagher won the NRA Highpower Championship with it. These guys have beaten me like a drum and I believe what they say. I have shot the 6.5×55 Swede for years and love it for all the reasons listed by others in the articles and comments. I don’t feel that I need to purchase all of the other compared rifles/rounds to notice relatively mild differences compared to a round developed in 1891 that has proven itself countless times. But then there is the fact that these comparable rounds do sell more rifles. I like the 260 because a lot of the loading tools I use for 308win I can use for it.